We are committed to making the Buckingham learning experience available to students so that no student is disadvantaged by their ability to fund their studies. The University of Buckingham is one eighth of the size of the average English University with an enrolment of around 3,000 students; of these, half are undergraduates. Within our undergraduate cohort, approximately 40% make their application through UCAS, the remainder applying for direct entry. Over 50% of Buckingham’s UK-domiciled undergraduate students are mature (HESA 2016/17), many of whom have been attracted to Buckingham’s two-year accelerated degree (which enables them to gain an Honours Degree in two years rather than three but with the same number of learning hours as the more traditional three-year degree). This parity of learning and teaching intensity is achieved by means of our four-term academic year structure (with 12-13 weeks’ vacation rather than the conventional 20-24 weeks). Buckingham’s MBChB is undertaken over 4.5 years, with 6 * 12 week terms in Phase 1 and 11 * 7 week blocks in Phase 2. The University is currently classed as an Alternative Provider under the terms of Student Finance England loan entitlements. In 2017 and 2018, Buckingham students are, therefore, entitled to a tuition fee loan of £6,165 per year rather than the £9,250 currently offered to students at publicly-funded universities; in addition to this, no account is taken of the accelerated nature of Buckingham’s programmes meaning that the gap in student-loan finance available for students completing a two-year degree at Buckingham and a traditional three-year degree at a publicly-funded university currently stands at £15,420. Maintenance and Postgraduate loans are, however, awarded in the same way as for any other Higher Education Provider. In order to mitigate this disparity, and to encourage the participation of students who would be otherwise unable to study at the University, undergraduate fees were frozen at £12,444 for 2015, 2016 and 2017 entry and supplemented by the provision of in-house bursaries and scholarships (please see Section 3 for full details). The fee was increased by 1.2% in 2018 to £12,600, in part to simplify our structure and payment terms. This means that the differential between our fees and the amount available from the Student Loans Company in tuition fee loans is between £6,435 and £3,335 per year depending on the level of scholarship/bursary offered. The University will continue to lobby for students studying on our accelerated degrees to be eligible for the same funding entitlement as their peers studying on traditional three-year programmes at publicly-funded universities and awaits the outcome of the consultation on fees for accelerated degrees along with the overall student finance review. The University’s admissions records for the last three years exemplify gender equality, with application, offer and acceptance rates remaining broadly static across all three stages. Furthermore, the University has been particularly successful in attracting male applicants when compared to the wider sector. The University returns HESA data on entrants from Low Participation Neighbourhoods and entry from state schools. The percentage of entrants from Low Participation Neighbourhoods in 2016/17 was 5.2%, against a location-adjusted benchmark of 9.3% (HESA PI 2016/17). In regards to retention and progression, the HESA non-continuation data shows that the University significantly outperformed its benchmark for both mature and young entrants in 2016/17. Only 2.4% of young entrants were no longer in HE following year of entry (HESA benchmark: 5.8%) along with 8.9% of our mature entrants (HESA benchmark: 11.6%). The University’s completion rates also outperformed its HESA benchmark in 2016/17. The University also meets its HESA benchmark on graduate employability with 92.8% of our graduates entering employment or further training against a benchmark of 93%. Over 75% of our 2016 graduates entered positive destinations according to the Times/Sunday Times Good University Guide 2018. The University is one of the few alternative providers to submit full DLHE data and will continue to support the new Graduate Outcomes Survey. The University has identified a need to develop strategies for addressing the attainment gaps in some protected groups. Although Buckingham’s differential attainment when split by ethnicity groupings is consistent with the lower attainment of BME students in the sector generally, our Schools have developed a strategic action plan, approved and monitored by the University’s Diversity & Inclusion Committee, aimed at closing the gap. The University exhibits no differences in attainment for students with disabilities and a steady improvement in outcomes for male students over the last five years. The University of Buckingham’s commitment to diversity and inclusion is embedded in its Royal Charter. Article 20 states that ‘There shall be no discrimination on the grounds of any person’s origin, belief, gender or disability such as to prevent him or her being admitted as a Member, Professor, teacher, other employee or student of the University or to hold office therein or to graduate thereat or to hold any advantage or privilege thereof ‘. In accordance with the Charter, the University is committed to creating and maintaining an environment within which inclusive learning, fair treatment and diversity are valued and discrimination is challenged. The University is a charity, registered with the Charity Commission under number 1141691. Its objects are ‘the advancement of education for the public benefit and the foundation, maintenance and support of an educational establishment for students, both male and female, to include residential accommodation and all necessary and proper ancillary services for such establishment ‘. The University’s culture of personal attention and responsiveness to students, reflected in the Personal Tutor system, student support, the accessibility of academic staff at all levels and the rapid feedback on assessed work was noted as an example of good practice in the University’s successful QAA Institutional Review in 2017 and in its TEF Gold rating (awarded in June 2017). Buckingham’s largest undergraduate programmes have annual intakes of less than 150. This means that even the largest lectures at the University can be less daunting and more interactive; indeed, the whole emphasis of the University’s undergraduate provision is on small-group teaching and developing a close academic relationship between students and staff. The aim is to help them feel that they belong to a learning community that values their views and that will help them achieve their potential. Finally, Buckingham’s record for teaching quality, student experience and student / staff ratio is amongst the best in the UK — with a top five ranking in all three components as confirmed in The Times/Sunday Times Good University Guide 2018. 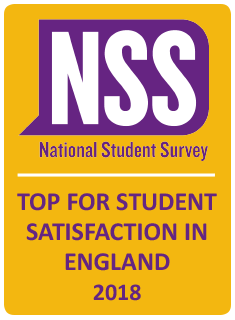 Equally, the University’s reputation for excellence in learning and teaching, academic support and the provision of learning resources is further evidenced by our consistently high performance ratings in the National Student Survey (since 2006, Buckingham has been ranked 1st or =1st eight times and 2nd four times). The University’s fee, bursary and scholarship programme has been designed to help widen access from UK students on lower incomes and to attract local students who may prefer to remain living at home to reduce the costs of studying at University. Bursaries and Scholarships support payment of fees and aim to close the gap between the amount charged in fees and the amount students are able to borrow from the Student Loans Company. With this in mind, the University awarded total scholarships, bursaries and prizes of over £768K in 2017. Scholarships and bursaries were funded as follows: £714K from general University income and £54k from the University Foundation or restricted donations received by the University. Of the total amount awarded, £542K was awarded to UK undergraduates via the Five Counties Scholarship (£390K), the High Achievers Scholarship (£65K) and the Buckingham Bursary (£87K). Individual bursary awards are made available to students who meet the general entry requirements and are distributed on the basis of need or to relieve hardship. In making means- tested awards, the University considers a number of factors including family income, investments and savings, assets and family circumstances. In September 2014, our Four Counties Scholarship was expanded to Five Counties and the bursary value increased to £1,100 per academic year. For 2018 and January 2019 entry, the figure will be £2,000 per academic year. To qualify for a Five Counties Scholarship, applicants must currently reside in Buckinghamshire (including Milton Keynes), Bedfordshire, Northamptonshire, Oxfordshire or Hertfordshire. Students who are in receipt of a student maintenance loan of over £5,000 per year, but do not qualify for the Five Counties Scholarship, are awarded a Buckingham Bursary worth £1,100 per academic year. In 2016, over 50% of our UK entrants qualified for these bursaries and scholarships. Buckingham High Achiever Scholarships, worth £2,000 per academic year, are available to UK students who achieve AAB or higher in their A levels; to ensure equity, a range of other equivalent qualifications are accepted on a case-by-case basis. Students can qualify for both the High Achiever Scholarship and Buckingham Bursary together. As an indicator of the programme’s success, since 2010, the percentage of Buckingham’s UK-domiciled undergraduate students has increased from 36% to over 50% in 2017 with the percentage of UK-domiciled undergraduate intake increasing from under 50% to almost 70% during the course of the same period. 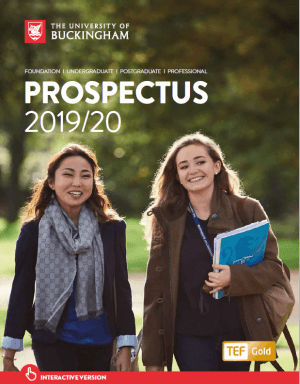 The University’s Student Recruitment team regularly visits local and national schools and colleges to raise awareness of the benefits of Higher Education and the opportunities offered by Buckingham’s two-year accelerated degree. We also enjoy close links with local Further Education Colleges and Access to HE programmes for mature students. Academic departments host regular taster tutorial sessions and conferences designed to add value to the A level, BTEC and IB curricula and to raise awareness of the two-year degree. These events are open to all schools in the region and the vast majority (circa 80%) of attendees are from state-funded schools. The University also hosts a Teachers Admissions Conference / Forum and the annual Festival of Higher Education, both of which are designed to raise awareness of key topics including social mobility, student mental health and fair admissions practices. Speakers at the Teachers Admissions Conference have included representatives from UCAS and Examination Boards and senior Admissions staff from the University of Oxford. Keynote speakers at the Festival have included the CEO of UCAS, the Head of OFFA and the Head of the Social Mobility Commission. In October 2016, the University was confirmed as a partner in the Study Higher Network, part of the HEFCE-funded National Collaborative Outreach Programme (NCOP), led by Oxford-Brookes University and including nine other local Universities and Colleges. The University’s involvement in 2018 and beyond will include support for activities in “cold spots” in the region (including parts of Milton Keynes, Banbury and the Aylesbury Vale area). The University also engages with local schools in raising awareness of the selection criteria for the Medical School, including providing access for guidance staff to observe MMI (Multiple Mini Interview) selection days. To assist in their transition into University life, registration at Buckingham is personalised, providing students with the opportunity to meet staff and fellow students and to engage in a wide range of induction activities. Wherever possible, students with disabilities or additional needs are identified prior to registration and tailored adjustments made. Early disclosure of additional needs is encouraged and internal assessments are arranged and specific interventions put in place as soon as possible after the student joins the University. Progress is monitored closely and includes ongoing comparison with the student’s qualifications at entry as well as the wider cohort. Monitoring of the effectiveness of the University’s procedures in this regard is undertaken on a termly basis by the Diversity & Inclusion Committee. Where applicable, students are guided through the Disabled Student Allowance (DSA) application procedures and support is organised by Band (1-4) depending on the student’s needs. This may include one-to-one study skills and mentoring or note-taking, study support, library assistance, scribing, reading or proof-reading and personalised Examination Access Arrangements (e.g. : extra time, the use of a word processor, the assistance of a reader or scribe, a separate room, rest breaks, coloured paper) — all of which is funded by the University. This level of support extends throughout the student’s studies and regular feedback is sought to ensure the provision remains appropriate. Personal Tutors are alerted to any student who might require special adjustments to be made and arrangements for teaching and assessment are personalised accordingly. The small-group tutorial system enables difficulties to be identified early in the student’s studies and additional support put in place as required. Equally, Programme Directors are tasked with identifying weaker students (and providing guidance, encouragement and support on progression); this is particularly relevant for students who may not have formally disclosed a disability but who are nonetheless experiencing difficulties. There is close collaboration between the students’ academic department and Student Welfare to ensure continuity of support. The University’s retention and projected completion rates exceed HESA benchmarks in the latest set of HESA PIs published in March 2018. The University’s Foundation Department offers a three-year inclusive Degree programme targeted at mature entrants who, in their late twenties or mid-thirties, have decided to take a career break in order to improve their qualifications and give themselves the chance of securing higher level roles moving forward. The programme includes a nine- month long Foundation element designed to give students the chance to settle back into study and identify the strategies they need to combine academic success with family responsibilities. The University is committed to providing ongoing support for students with disabilities. This is in line with Buckingham’s obligations under the Equality Act 2010 and in keeping with our long- established ethos of personalised student care. With this is mind, students are given, in addition to the University’s counselling service and emotional well-being support, timely access to external health-care providers including the local GP surgery, talking therapy services such as IAPT (Healthy Minds), NHS Mental Health services and drug and alcohol support. Frequent contact between tutor and student permits individual attention for students who may be experiencing academic and/or non-academic challenges and assists in the retention of students who might otherwise have left the University. Qualitative evidence (such as anonymised NSS, PTES, PRES and internal module-level commentary) suggests to the University that our students do make a positive correlation between Buckingham’s teaching intensity and their own levels of satisfaction with academic provision. We are committed to making the Buckingham learning experience available to students so that no student is disadvantaged by their ability to fund their studies. Those who gain a place, but who cannot afford to pay, will receive as much support as we can offer; this is directly linked to the level of funding support generated from our Alumni, Trusts, Foundations, Legacies and Corporations. Our increasing UK outreach work, and continued drive to more clearly articulate our structure, bursary and scholarship programmes aims to ensure that we continue to improve our HESA PI widening participation benchmarks into the future. In addition to this, we will continue to improve collection of state vs independent school and POLAR admissions data from our direct and UCAS entrants. Finally, we will continue to monitor our student performance data, as well as our student support arrangements, to ensure that performance continues to be consistent across all student cohorts and in line with sector averages.